April 23, 2005—the second "modern" exhumation of Jane McCrea's grave. The exposed coffin, containing the bones, is the new one placed in the grave in 2003. What is it like to dig up an American icon—in this case the most famous woman to be murdered and scalped during the American Revolution? Over the past three years, I have worked with the remains of Jane McCrea. Her tragic death on July 27, 1777, prompted thousands of outraged Americans throughout the northern colonies to rise up against British authority because Jane had been murdered by Indians who accompanied General John Burgoyne on his march south from Canada. Jane’s death thus contributed to the great American victory later that year at the Battle of Saratoga, known as the “turning point” of the American Revolution. What happened next has been hotly disputed by historians, but it appears that two competing bands of Indians fought over who was to receive the reward for delivering Jane to her fiancé. While we know that she was then killed and scalped, it is unclear whether her death was a deliberate murder or merely an accident. The Indians claimed afterward that an American musketball, intended for them, had mortally wounded the young Scottish-Presbyterian woman. Faced with the prospect of no reward, they scalped her and took the scalp to the British camp. David Jones recognized Jane’s hair in the middle of a pile of scalps. He recovered her body, and buried her about three miles south of Fort Edward. The colonial population intrepreted Jane’s murder as a symbol of British oppression—and American leaders manipulated her image most effectively as they organized resistance to British authority. Ironically, after her first burial in 1777, Jane McCrea was later dug up and relocated twice because of her prominence as a tourist attraction. In 1822, she was moved to State Street Cemetery in the Village of Fort Edward where her remains were placed atop the brick vault of Sara McNeil (who had passed away naturally in 1799 at the age of 77). In 1852, she was exhumed again and moved to the newly-created Union Cemetery in Fort Edward. A disturbing story later appeared in a local newspaper that year, describing how the box containing Jane McCrea’s bones had been “broken open and nearly all the bones stolen,” and her bones were “scattered all over the country.” (The 19th-century fascination with collecting bones as souvenirs is perhaps little different from the current popularity of television programs such as “CSI,” “Forensic Files” and “The New Detectives.”)History alone could not establish whether any of Jane McCrea’s bones still rested in her third grave in Fort Edward. 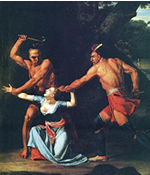 The death of Jane McCrea in 1777 became a popular subject for artists of the time, such as John Vanderlyn's interpretation (left) The Death of Jane McCrea(1804, Wadsworth Atheneum). Given the many questions surrounding the circumstances of Jane McCrea’s death and subsequent reinterments, I wrote to her oldest living relative, Mrs. Mary McCrea Deeter (then 97 years old), on May 1, 2002, and asked whether she would give her consent to an exhumation and forensics study that would establish for certain whether Jane McCrea actually rested in Union Cemetery. Upon receiving her consent, I retained an attorney to draft a petition to the Supreme Court in Washington County, N.Y., and assembled a team of forensic scientists and archaeologists including several forensic scientists from the New York State Police Forensics Investigation Center and Dr. Anthony Falsetti, head of the C.A. Pound Laboratory at the University of Florida in Gainesville. The court granted our petition in November 2002, and I chose April 9, 2003 as the date for the fourth and—we hoped—final exhumation of Jane McCrea. Using the skull as a starting point, scientists were able to reconstruct the features of Sara McNeil, the 77-year old female colonist who was Jane McCrea's companion in life and death. All between the hours of 6 a.m. and 8:30 p.m. that day, we conducted the exhumation, found the original burial trench, and discovered the remains of a 20″ x 24″ box containing the skeletons of two women—but only one skull, from a very old woman who had definitelynot been scalped. I was the archaeologist in the bottom of the trench, responsible for excavating the bones and passing them up to the scientists who took measurements and collected bone samples for mitochondrial DNA (mtDNA) testing. We also brought in a radiologist who took x-rays to look for possible cause(s) of death. In addition to the two dozen scientists and historians who attended the exhumation, I was joined by a PSU student, Jennifer Gynan, who was one of our bucket-carriers and sifters. At the end of the day, we placed all of the bones inside a modern coffin and returned it to the grave. A Presbyterian minister said the burial service (again! ), and then the process of analysis and interpretation began. The presence of two skeletons was utterly unexpected but, since one set of bones was from a very old woman, I acted on a hunch and contacted a descendant of Sara McNeil to find out whether there might be a modern-day maternal descendant of Sara’s from whom we could obtain an mtDNA sample for comparative testing. There was an off chance that the bones of Sara had become combined with Jane’s in 1852, and the two women might have been moved together to Union Cemetery. It took a full year for the U.S. Department of Defense to prepare a DNA sequence for the “ancient DNA” from the grave but only a couple of weeks to collect the modern DNA from a 94-year-old (seventh generation) descendant of Sara McNeil and to have the samples compared. And sure enough, they matched! Sara McNeil, Jane’s companion at the end of her life, had joined her in death. We returned to the grave on April 22, 2005 with yet another court order from the Supreme Court, and this time we were able to do a much more thorough separation of the two commingled skeletons. We prepared a reconstruction of Sara’s 77-year-old face from the skull discovered in the grave, and I experienced the thrill of showing “the face” to the descendants of Sara McNeil just before we returned both women to the ground, each with her own coffin. In addition to reconstructing Sara’s face, perhaps the most significant outcome of our new work was discovering that the skeleton of Jane McCrea was just as intact as that of Sara McNeil. Because of the old stories about Jane’s bones having been stolen as souvenirs, we had assumed that no more than a handful of the bones might be hers. However, this time it was possible for Anthony Falsetti to spend much more time with the bones, and as he laid out the two skeletons side-by-side on our laboratory tables, it became clear that most of the major limb bones were present from both women, but with very few surviving ribs, vertebrae, hand or foot bones. Jane McCrea’s skull was missing from the assemblage (no doubt stolen as a souvenir in 1852), so while it is now possible to describe even the face of Sara McNeil, we can only say that Jane was a petite woman, between 5′ and 5’4″ tall, with no evidence of any injuries on the bones that were still in the grave. The relatives and descendants of Jane and Sara have been quite pleased with our efforts to bring both women “back to life” and to restore to them a part of their identities. One of the very real benefits of our research is that we have prompted a flurry of new historical research into the lives of 18th-century women on the frontier of upstate New York. We have also prompted a host of questions about when we might go back into the grave for what would be the sixth time. David R. Starbuck is associate professor of anthropology in the department of social science at PSU. 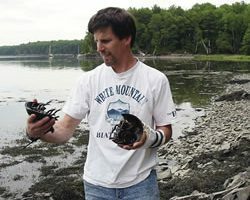 His specialty is the historical archaeology of the Northeast. His two most recent books are Neither Plain Nor Simple: New Perspectives on the Canterbury Shakers and Rangers and Redcoats on the Hudson (both published by University Press of New England in 2004). 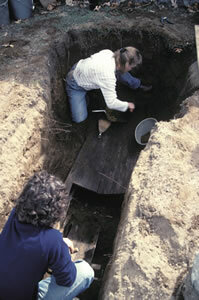 The Archeology of New Hampshire is due in spring 2006.